Welcome to the start of another tax year. There are a lot of changes to take in. I can see that implementing Making Tax Digital for VAT and dealing with any outstanding contractor loans will take up a lot of many peoples' time. It can be difficult to keep up with complex tax legislation and this week we take a closer look at the issue of what it means to be careless about your taxes. There is a difference between being careless because you are naive, ill-informed or muddled, and making a deliberate decision to not to care. Making a deliberate decision to do or not to do something is treated as committing fraud by HMRC, others may disagree. How then does a rational person act when faced with tax legislation that stands nearly three feet high? That depends on a multitude of factors. This time we look at four different cases where it was essential to determine whether the taxpayer or their agent was careless in order to apply the correct tax rules. They all illustrate different examples of what HMRC considers is careless behaviour and in all cases the tribunals took a different view to HMRC. Do read the Richie summary, and I recommend our guide to Discovery Assessments too. From 1 April 2019 non-resident companies start making the change from self assessment to corporation tax. A new registration is required with HMRC. Disguised remuneration: paying the loan charge? When do you need to join? Who can claim exemption from Making Tax Digital for VAT? What are the issues? A note for paid subscribers explaining what HMRC fails to. 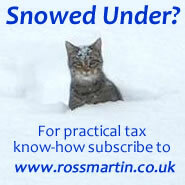 UPDATE: instant CPD, an at a glance guide to keep you up to date in SME tax. UNMISSABLE: The latest version of one of our most popular guides. UPDATE: This guide now has examples for the new 2019/20 tax year. Buy-to-let ownership: personal v. company? UPDATE: what is the optimum form of ownership since the restriction in interest deduction? UPDATE: when and how can HMRC open up an enquiry into a closed year. How far back can they assess? In William Richie & Hazel Richie v HMRC  UKUT 0071 UKUT 0071 the Upper Tribunal decided that the conditions for a discovery outside of normal time limits had not been met: the carelessness of a specialist adviser was untested. How it works, is it worth it? UPDATE: at a glance guide to assist you to correctly tax transactions involving property. Zero rating: alteration or repairs? Want to know more?Commission your own articles and checklists.